This is a terrific romance thriller, a genre that Hitchcock excelled in, where regardless of what the narrative is about it is the relationship between the protagonists that really matters. 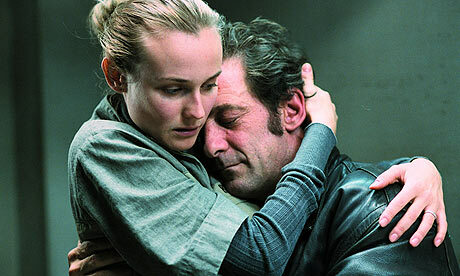 Vincent Lindon is brilliant as the ordinary man forced to do extraordinary things for the woman he loves. Some critics, The Guardian‘s Peter Bradshaw amongst them, complained about the implausibility of the plot; but that’s not the point, the drama is about what a person could do for love. Sight & Sound had a more relevant reservation: why was the wife (Diane Kruger) and her son, the victims, beautiful blond types, whilst the bad guys – drug dealers and police who attempt to foil the husband’s plot – ethnic minorities?